Swinging faster will all be for nothing if you don’t hit the center of the clubface. Because in 1998 Golf Digest did a study into how much off-center impact shots affect distance. Here is the result of the study for a 100 mph swing. So contacting a golf ball an inch off the center of the clubface with a 100 mph swing speed results in a 31 yard loss of distance! One inch off center and you lose over 30 yards!! If you don’t quite believe this, here is a sports science program in which they show this happening. It also has some interesting results about swinging a heavy object before playing golf. Now in this program I’ve got you to swing a broom which is quite a bit heavier than your driver. And you should not use that to warmup if you’re going to play a game of golf straight after. It’s all right to do this as far as stretching your muscles and warming up for some exercise or drills however. Anyway, you now know that hitting the center of the clubface consistently can only help you to hit the ball further overall. In response you may say that you have game improvement irons or a super big headed driver. Well, sorry, but you need to understand that it doesn’t matter how big a golf club is because all clubs have the same size sweet spot. The sweet-spot is equivalent to the club head’s center of gravity, and as such the sweet-spot is very small. It is about the size of a dime or a circle 1 centimeter in diameter, which is just under 1/2 of an inch. So if you miss the sweet-spot you’ll be losing distance no matter what golf club you’re using. The purpose of all of this information is to drum it into you that if you want to hit the ball longer you should be practicing hitting the ball consistently out of the middle of the clubface…. i.e the sweet-spot. So how do you practice hitting out of the sweet-spot? Well, there are lots of ways of practicing this. You can get some spray to put on your clubface so you see where you’re striking the ball. Click here to find out more about the spray product that does this. Or you can use impact tape. You can put talcum powder on the back of your golf balls so a mark will appear on your clubface etc. But no matter what you use to get feedback, if you want to add yards to your drives…practice hitting shots consistently out of the sweet-spot. You’ll find when you do this that you probably will have a tendency to miss the sweet-spot in one place. It may be the heel or toe but it will generally be one or the other for most of your off-center shots. Finding out where your misses generally are will be very beneficial for you and will help you to hit longer drives. 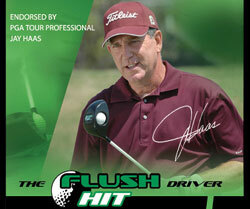 The flush hit driver is a driver with a hole in the middle of it. And when you get it you get foam golf balls. If you hit the ball in the middle of the sweetspot the ball is sucked into the clubface. If you don’t contact the center of the club the ball goes shooting away at a funny angle which is great feedback. And depending on where the ball goes you can tell where you missed the clubface. To find out more about this great training club go here. Practice (however way you want to) hittng shots out of the center of the clubface – consistently!